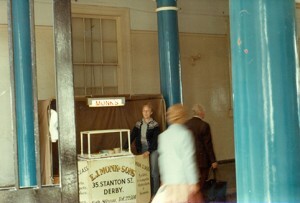 The Monk family opened their new Pyclet Bakery in Edward Street, Derby. The men baked, the women sold them from barrows under the Guildhall arch at the northern end of Derby’s then new Market Hall. Emily Monk took her place behind her barrow under the guildhall clock where she sold pyclets (in her words) “every day bar high days and holidays” until 1963. Emily passes on to the great bakery in the sky, and is succeeded by her, Rose who lived next door to the bakery and for many years helped the family. A combination of the Oil Crisis, the rise of the supermarket and the lack of interest from younger members of the family led to production ceasing in Derby. The Pyclet bakery is split into four houses, and the very existance of Derby Pyclets passes into history. Mark Hughes buys his first home, a converted shop. Ian his conveyancing Solicitor, recognising the name Monk on the deeds and recalls their history. June 21st After some experimentation, we came up with a recipe and method for making Pyclets. Serving them at a friends party, they go down a storm topped with Smoked Salmon and Horseradish Cream, Stilton Honey and Walnuts or Coronation Chicken and Lime Pickle. Following the party on the 1st July Mark moves into his new House. 14th July Captured by the idea, we turned up on Derby Market Place with a pop up and, like in “The Apprentice” sees if the public will buy them. From the first day they prove to be a hit. April 2012, After 9 cold and hard months baking from a domestic kitchen and selling from a pop up, enough money had been saved to open a bakery in Derby’s Glorious Market Hall. After four successful years in the market the Pyclet Parlour has been nominated as a finalist in the BBC Food and Farming Awards 2016. From the 1st September 2016 Katie opened up the Pyclet Parlour for the first time, after eating here for over 3 years she decided to work with Mark and eventually take over the Pyclet Parlour with Mark Hughes moving on to attend events & wedding buffets with Derby Pyclets. Looking forward to a different lifestyle Mark is excited about re-opening his art studio. Rejoined Social Media! COME JOIN US! With everything remaining the same, all the same delicious recipes and menu toppings, as a sport nutritionist Katie is looking to add healthier options to our pyclet topping menu and provide a full macro breakdown so you can add them in to your diet and have a tasty healthy, nutrition packed lunch to break up a week of food prep!